Walt Ottenad’s gallery of the opening event on the 2008 ABRA calendar in Evansville, IN. Even after all the bad luck and misfortune, we made it into the final heat as the trailer boat. The boat was looking good and running well (though not making up too much ground due to the condition of the course), when we all heard a “boom” and saw the U-13 go dead on the backstraight. Damn. 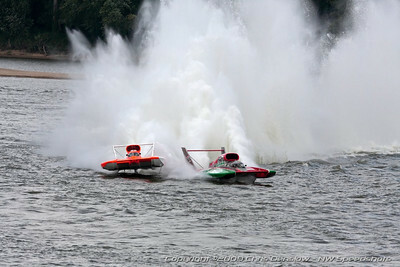 Chris Denslow’s gallery of Unlimited action at Evansville, IN.